David Ramey is a prominent, veteran California winemaker who is known for his Chardonnays. He has been an innovator who led the charge over 30 years ago away from technically proficient squeaky clean wines towards natural winemaking methods. The sources for Chardonnay have been impeccable including Ritchie Vineyard, Hyde Vineyard, and Hudson Vineyard. In 2012, he released a Pinot Noir from the Platt Vineyard in the Sonoma Coast. A number of Napa Valley Cabernet Sauvignons and a Sonoma Coast Syrah round out the lineup. 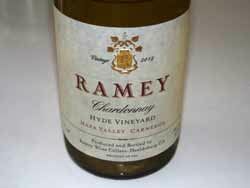 In 2012, Ramey bought Westside Farms in the middle reach of the Russian River Valley and the first ever Estate Chardonnay was produced from this vineyard in the 2014 vintage. A Rochioli Vineyard Chardonnay was introduced in the 2015 vintage. The wines are sold through a mailing list with some retail distribution.